The writing you do on the FORM blog is such a generous gift to the Sydney dance community—writing about shows and showings, many of which don’t get reviewed otherwise, you put on record these ephemeral happenings with such insight and well-formed verse. But who will write about your show? Maybe we should do a “guest spot” for you? Let me know what you think; I could have copy for you on Monday or Tuesday next week. It was very exciting to see those ideas you shared with me a while back around business language and indigenous issues coming together so brilliantly in performance. Your writing is quite extraordinary and the way you are confronting the reality of the current economies and protocols around contemporary indigenous art is brave and smart. You are doing such important work. I can’t wait to see what happens next…. 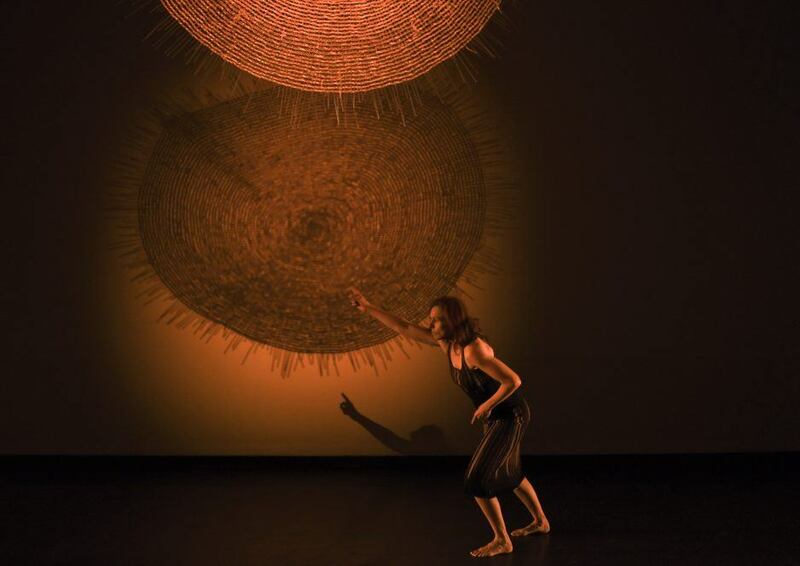 She’s so sharp this woman, the writer’s ‘voice’ speaking even more to us than the speaker, the performer, speaks, the beautiful astringency slipping into our awareness, which has been so exquisitely expanded by the suspended circular woven mat that hangs in the space throughout the show. It casts its reverberances (‘Vicki made that herself’ ripples through the seating space; and I know reverberances is not a word but it feels more active, like that circle of crafted skill) gently casting its lights and shadows across all the action. Circles sit in circles and the actions, at first seeming to dart across disconnected registers and modes, come back around again in the deep rhythms of the final movement sequence, giving us a place to land. Vicki Van Hout is dancer, clown, weaver of the mundane, the awful, the sublime and the ridiculous, with a constantly rigorous focus on shibboleths and careless assumptions we make around our relationship to indigenous identity and the making of art. A question popped into my head during the last sequence: How did you come to know how many repetitions were going to be needed to lead us up out of all those places to which you had taken us, and leave us to swirl out of the theatre, the beautiful circular mat still suspended there, and glowing? Your performance was galvanising on so many levels; rich layers of language, text, dance, comedy. It felt to me your comedic sensibility softened the harshness of the issues you were raising and encouraged us to listen to you more deeply. You drew us in rather than you sending it out (if that makes sense). You did not ‘tell’ me what I should think and I had free agency to reflect upon what you were saying; quietly examining my own assumptions of our cultural, economical, and all the other ‘divides’ that become rooted in our minds and therefore, impact daily reality of ourselves and on each other. I just love the way you investigate language and the extraordinary complexities and juxtapositions that arose. You’re a genius wordsmith and dancer in equal parts (rare!). Most importantly: I need to see it again—perhaps several times—as it is that kind of work. May the stars align for its long life! I so enjoyed your show the other night—‘enjoyed’ doesn’t seem like quite the right word, however. It was a shot in the arm, adrenaline to the heart, a punch in the face, food for the soul… all clichés for a show that was very far from one. I waxed lyrical about it on Facebook, and then, worried that not everyone in the world (or at least Sydney) would get to see it, I pitched an article about it to The Conversation. Because the show was truly brilliant—I really want it to be acknowledged what a treasure of a performer and artist you are. This is tough territory you are negotiating, with wit and smarts and sophistication. Your deconstruction of contemporary Indigenous dance, which weaves in and out in the structure of the show, is a lesson in artistic rigor. The physical precision and articulation of your performance is second-to-none—your detailed gestural performance which accompanies the acerbic text, as well as your bending and reshaping of stomp, step, jeté, Graham contraction et al. to your own choreographic ends. And the many broader implications for contemporary Australian life (and Australians), hard questions of reconciliation between immigrant and indigenous peoples and ways of being, spin out in all directions from this core inquiry. Just who are we indebted to… who is trespassing… who are we borrowing from… who suffers… who owns what (or what owns whom)… what is worth keeping… what are we willing to sell to the highest (or lowest) bidder? Furious, funny, fabulous—I don’t understand why Vicki Van Hout is not famous.